Diane Bengtson holds up the quilt she won from the Friends of the Library. Photo from Donna Clark. 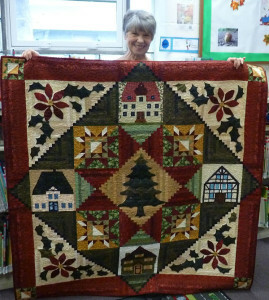 The Cedar Springs Public Library raffled off a quilt as a fundraiser on Red Flannel Day, and raised $301. The lucky winner of the quilt was Diane Bengtson, a longtime resident of Cedar Springs. Members of the Friends of the Library sold tickets for five hours on Red Flannel Day, and the drawing was held at 5 p.m.
Sons of the American Legion, Glen Hill Squadron 287, of Cedar Springs, congratulates Ernie Adams, of Cedar Springs. Ernie’s winning ticket for our annual Rifle raffle was drawn on November 9. 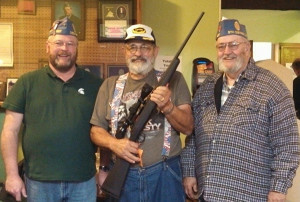 Pictured are SAL Commander Dominic Merlington, Ernie Adams holding his new Savage 270, and SAL member Keith Tyler. The Sons of the American Legion, Glen Hill Squadron 287, of Cedar Springs would like to congratulate John Twork of Holton, MI. 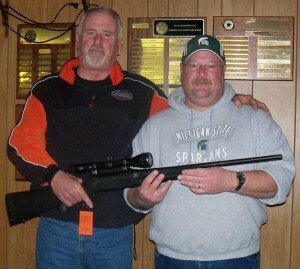 John’s winning ticket for our annual Rifle Raffle was drawn on November 12. Pictured are John Twork and SAL Commander Dominic Merlington. Congratulations to our Best Lips 2011 winner, Tracy Salisbury, of Cedar Springs! Tracy won a dinner for two, courtesy of the new Main Street Restaurant (at the corner of Main Street and Muskegon), two tickets to the Kent Theatre (courtesy of the Kent) and flowers with a balloon and teddy bear from the Cedar Springs Post. Thanks to all of you that entered, and a BIG thanks to the Main Street Restaurant and Kent Theatre for partnering with us on prizes!